Paul WhiteIs an old man using witchcraft to turn himself into aleopard, seeking revenge on those who took away his power?Baruti the hunter trusts in God - but will he have to becomethe bait to save the villagers? 146 pages, for 8 to 12 yearolds, from Anzea. 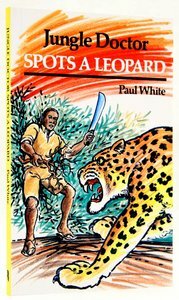 About "Jungle Doctor Spots a Leopard (Jungle Doctor Adventure Series)"